Litfest is one of the founding members of the Lancaster Arts Partnership. 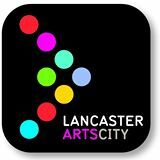 to champion and promote the strategic development of excellent arts activities in Lancaster District. The Lancaster Arts Partners run the First Fridays programme of events.